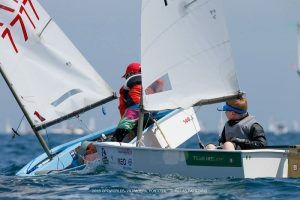 Royal Cork flies the flag at the Optimist Worlds! 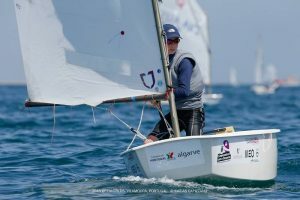 Racing commenced today at the Optimist World Championships in Vilamoura, Portugal. Two races were completed today with racing scheduled to run each day until July 1st with Team Racing 2/3 July and Closing Ceremony on Sunday, July 3rd. Royal Cork have three club members competing at the event. Cathal O’Regan and Rory O’Sullivan are on Team Ireland whilst Atlee Kohl is representing the US Virgin Islands. Atlee participated in the Club Skills for Gold Programme before departing to join his team mates last Thursday evening. 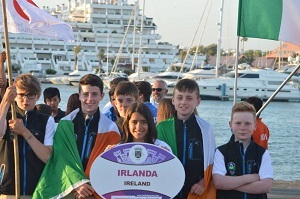 The Irish Team comprises of Cathal, Rory, Tom Higgins – RStGYC, Harry Bell – HYC and Micheal O’Suilleabhain – KYC. The team travelled with coach Thomas Chaix on Friday morning having spent the previous week at the Pre Worlds event. Last night the Opening Ceremony was held and 259 sailors paraded with their flags representing 59 countries. We would like to wish Cathal, Rory, Atlee and all the sailors the very best of luck.